Miss Nebraska, Sarah Rose Summers, has been named Miss USA. Cheers rang out, confetti flew and celebratory music blared as Summers — a 23-year-old from Omaha — accepted the sash, the dazzling crown and a bouquet of flowers on Monday evening. She takes over from Kára McCullough of the District of Columbia and now goes on to represent the United States in the Miss Universe competition. For the next year, she'll be a spokeswoman for the Miss Universe Organization. Her responsibilities will include performing charitable acts, attending galas and fundraisers, and making special appearances, among many other duties. 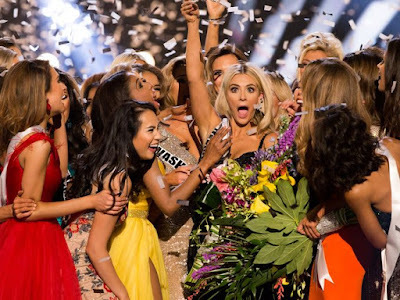 By nabbing the Miss USA crown, Miss Nebraska joins Miss Kansas — the winner Friday of the 2018 Miss Teen USA crown, also in Shreveport — for a heartland sweep of the events held this year in Shreveport and Bossier City. The selection committee included a host of female entrepreneurs, business leaders and industry experts and former Miss USA contestants. Viewers were able to vote online for their favorites throughout the competition. The two-hour final event began with the announcement of the 15 semifinalists. In addition to Summers, they were: Madison Nipe (South Dakota), Marianny Egurrola (Georgia), Marina Gray (Maine), Logan Lester (Texas), Alexa Noone (New Jersey), Génesis Dávila (Florida), Carolina Urrea (Nevada), Allissa Latham (Massachusetts), Brittinay Nicolette (Maryland), Alexandra Harper (Tennessee), Toneata Morgan (Oregon), Caelynn Miller-Keyes (North Carolina), Elizabeth Johnson (Michigan) and Kelley Johnson (California). The semifinalists were selected after a round of preliminary interviews and live on-stage presentations last week. Monday, the 15 contestants kicked off the final event with the swimsuit round. Next, the top 10 were announced and presented in evening gowns. The 10 represented South Dakota, Georgia, Maine, New Jersey, Nebraska, Florida, Nevada, Tennessee, North Carolina and California. The field then was cut in half, leaving five to answer a question from the judges. The five finalists were Nevada, Florida, Nebraska, North Carolina and South Dakota. Two more competitors were cut, leaving the top three: Nebraska, North Carolina and Nevada. The three were asked the same question and presented for "the final look." After scores were tallied, the runner-ups and winner were declared: second runner-up, Miss Nevada Carolina Urrea; first runner-up, Miss North Carolina, Caelynn Miller-Keyes; and winner, Miss Nebraska Sarah Rose Summers. The Miss USA finals were co-hosted by model and former Miss Teen USA winner Vanessa Lachey and her husband, Nick Lachey, who rose to fame with 98 Degrees. Lee Brice, a Grammy-nominated American country singer, performed as the 10 contestants presented their evening gowns. Lachey's band performed as the three finalists presented their final looks. Fashion expert Carson Kressley and supermodel Lu Sierra checked in with behind-the-scenes footage, analysis and commentary about the competition. On Friday, Hailey Colborn, of Kansas, was crowned the 2018 Miss Teen USA.